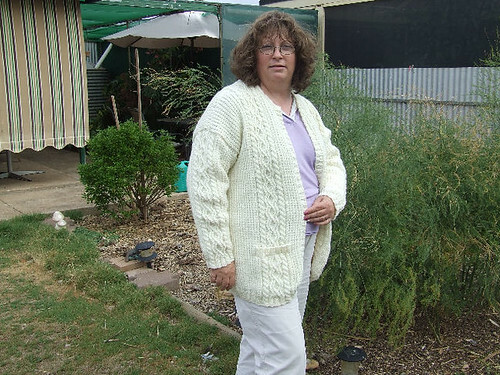 12 ply cardigan all finished and ready for the lady I knitted it for in Vic. Going to now knit some fiddly things like socks, scarfs, Bimbo wants a winter coat and I want some coat hangers. Re: Aran cardigan all finished. My goodness Lucky you have been busy..how long did that take you to knit? Started it September last year and completed it today. Mind you I didn't knit it over the hot weather. I do knit for people but I also charge for my time..... cheaper though than to buy one in the shops. Lovely cardi, how do you work out/put a value on your time when you make something to sell? I am always in a dilemma about this, so probably don't do enough crafting of any type to sell, but I would like to. However the people in our town seem to expect to buy things for next to nothing at stalls when the markets are on. hhmmm depends on how much is involved in what I am knitting to what I am going to charge. My sister & I are going to have a stall next year and so I am going to need to do some research on what folks charge for some of their items, they sell. 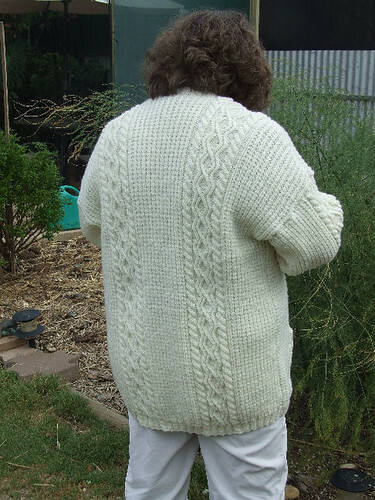 I have had people expect a cardigan like that within 4 weeks and knitted for free Hence they don't get it. Lucky...you are clever..I bought a vest (the style that is everywhere for this winter) & have thought today I might look around for a pattern & have a go at knitting one...I have always loved vests..if my back is warm I'm fine...have you seen the vests that I am referring too or any patterns in your travels? Tell you what I'll go through my knitting patterns as I have oodles. If there are any Aran patterns I'll private message you and organize a postal address and I'll photocopy them and send it all to you. Sounds great Lucky...keep in mind that the pattern needs to be simple...not a good knitter!!! So basic cable maybe a diamond shape thrown in for good measure??? Elf cooked tea tonight as we went for a walk, once the rain clouds cleared up. I was so tired by the time we got back. Lucky1 wrote: Elf cooked tea tonight as we went for a walk, once the rain clouds cleared up. I was so tired by the time we got back. I'm so far behind. I've been knitting for the littlies. I need to drag out some UFO's from 2 or 3 years ago if I want anything to wear this year. Anything I start now for myself will be fated to be finished in 2012. I will do some socks though. I need them right now it's so cold here. Thanks Siri. I too knit sock as of this year...... never thought to do it before now.